It’s our favorite day that comes every week, Friday! And what a beautiful week it has been. The sun has been shining, with an occasional rain storm, but the temperatures are rising! We’ve had a fun filled, busy week here at Sugar Fix Dental Loft, and we’d love to share with you what our week was like. A new patient was welcomed into our office for a cosmetic consult where he wanted to discuss the state of his current veneers. He wasn’t too fond of the color of his veneers, and a little discouraged from ever getting them done again. When deciding if veneers or crowns on your front are a good fit for you, sitting down and having a consult before any choice is decided is very crucial. That is why we always encourage a consult at our practice with Dr. Jessica Emery! That way we can take a look at your current smile, and decide what the best option is for you. Dr. Emery gets to know you and listens to you on what you’re looking for. When deciding if veneers or crowns on your front are a good fit for you, sitting down and having a consult before any choice is decided is very crucial. That is why we always encourage a consult at our practice with Dr. Jessica Emery! That way we can take a look at your current smile, and decide what the best option is for you. Dr. Emery gets to know you and listens to you on what you’re looking for. This week we also had a patient come in that wanted to brighten her smile up! 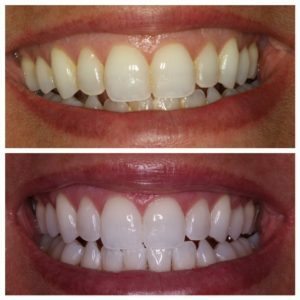 Our ZOOM in-office whitening treatment is such an amazing way to get your teeth a few shades whiter! Look at her transformation below! A perfect smile for spring! If you ever have any questions, please give our office a call! We’d love to hear from you.